The Christie® M Series projector platform provides the high-performance and feature-rich standards expected in all Christie products. The most compact in its class with embedded warping, blending and color matching. The Christie M Series platform includes four resolutions, WXGA (1366 x 768), SX+ (1400 x 1050), HD (1920 x 1080) and WUXGA (1920 x 1200). 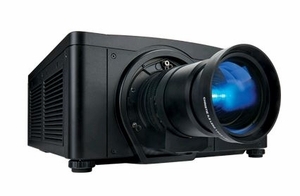 Each of the projectors in the series can be fitted with the broadest range of high-quality lenses – all with true Intelligent Lens System (ILS™) capabilities.